Cir.kus, a troupe of talented unusual performers. Ium- Place of. A Panda Moaning Yum. 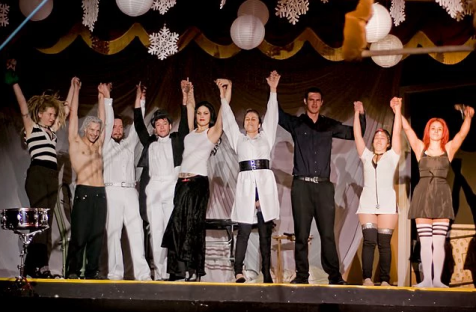 Cirkus Pandemonium is a fantastical Cirkus troupe based in San Francisco and the West Coast US. Capable of perfroming several types of shows, from theme shows to variety shows to theatrical productions. Tromping Fairies and Devious Demons cavort through the air and upon each others bodies in the land of Pandemonium. Skills include: Aerial silk, trapeze, double trapeze, acrobalance, juggling, contact juggling, stilts, plate spinning, object balance, bed of nails, strong man feats, unicycle stunts, tumbling, firedancing and eating, and other strange acts. Cirkus Pandemonium has performed at Health and Harmony Fest, Burningman, Autonomus Mutant Fest, Raves, Nightclubs up and down the West Coast, Private Parties, and Corporate Events.